The departure boards at London's St Pancras station are regaining their eclectic character of yesteryear. Cast back half a century and St Pancras had its share of trains to fire the imagination. Perhaps the most distinguished morning departure from St Pancras in those days was the 11.20 Midland Pullman to Nottingham. This train consisted only of first-class Pullman cars, affording cushioned comfort for passengers taking a leisurely luncheon as the train cruised north to Nottingham. With two stops along the way, The Midland Pullman reached Nottingham in just two hours. Beeching's cuts and the demotion of the Midland Main Line to secondary status meant that St Pancras slipped quietly into obscurity. The station and its once-magnificent hotel languished in neglect. The grand expresses no longer left from St Pancras. That all changed in 2007 when Eurostar moved to St Pancras. "Railway stations and hotels are to the nineteenth century what monasteries and cathedrals were to the thirteenth century. They are the only truly representative buildings we possess." The departure boards at London's St Pancras station are regaining their eclectic character of yesteryear. Cast back half a century and St Pancras had its share of trains to fire the imagination. Fifty years ago, a bright star on the morning departure boards was The Palatine which steamed out of St Pancras at 7.55 and sped north to Manchester, beyond Derby using a beautiful rail route through the English Peak District that has long since disappeared from the maps. Then there was The Waverley at 9.10. This handsome express took in some of the country's finest mountain and moorland scenery on its ten-hour run to Edinburgh. It followed the celebrated Settle to Carlisle line through the northern Pennines (running non-stop between Hellifield and Appleby). From the Scottish border just north of Carlisle, the train used the now-abandoned Waverley route through Hawick to Edinburgh. Perhaps the most distinguished morning departure from St Pancras in those days was the 11.20 Midland Pullman to Nottingham. This train consisted only of first-class Pullman cars, affording cushioned comfort for passengers taking a leisurely luncheon as the train cruised north to Nottingham. With two stops along the way, The Midland Pullman reached Nottingham in just two hours. Beeching's cuts and the demotion of the Midland Main Line to secondary status meant that St Pancras slipped quietly into obscurity. The station and its once-magnificent hotel languished in neglect. The grand expresses no longer left from St Pancras. 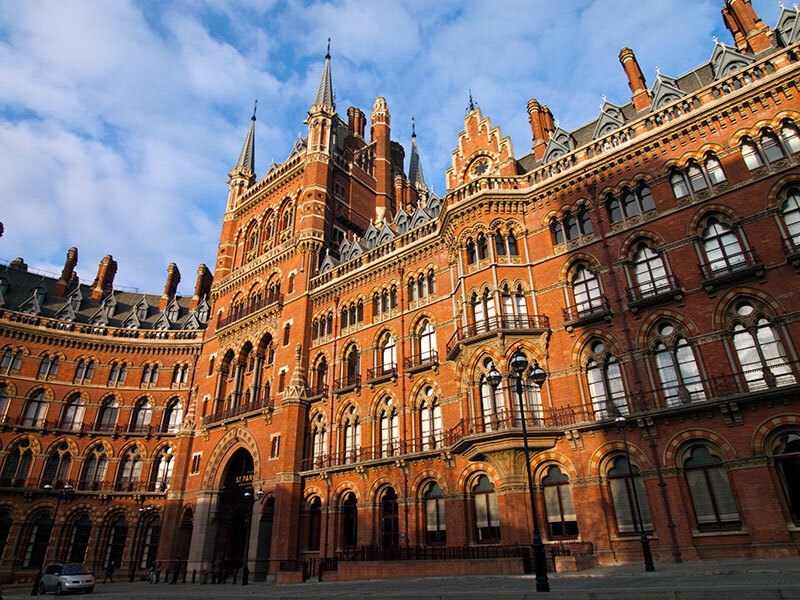 St Pancras' twilight years ended with its landmark restoration, and Eurostar's move to St Pancras in late 2007. Suddenly the departure boards livened up again. No longer was it merely the slow train to Luton or the semi-fast to Leicester, but now Lille popped up on the departure boards. Sleek Eurostar expresses with names like Voyage Vert now graced the platforms in the superbly restored train shed at St Pancras. Suddenly there were through trains to continental capitals. Eurostar has its own ambitions, which this year are nicely symbolised in an experimental train service which will run in May and June. On the morning of 4 May Eurostar will operate the first-ever direct train to Aix-en-Provence. Just think how that one will look on the departure boards that Saturday morning. Passengers can choose from two departures at 7.17 - one to Bedford and the other to sunny Provence. Eurostar will purr from St. Pancras to Aix-en-Provence, a journey of 1,215 km (about 755 miles), in just over six hours. This new link from London to Aix will earn a place in the record books. Never before has there been a regular scheduled train service from London to so far-flung a destination. Even in the days when there were direct overnight sleepers from London to the continent (with the sleeping cars conveyed across the English Channel on a ferry), there were never services to match Eurostar's new offering. The through sleeping cars to Switzerland were the limit. Railway stations are indeed temples to modern mobility, veritable cathedrals of transport. And the listings on their departure boards map a city's connectivity. Aix captures the very spirit of the south, the essence of Provence. And this spring it moves a little closer to London.